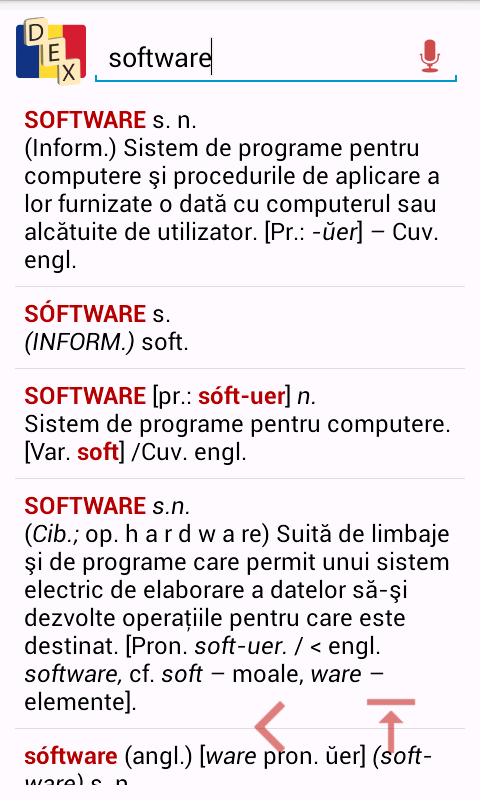 DEX is a Romanian explanatory dictionary for the Windows Phone platform. 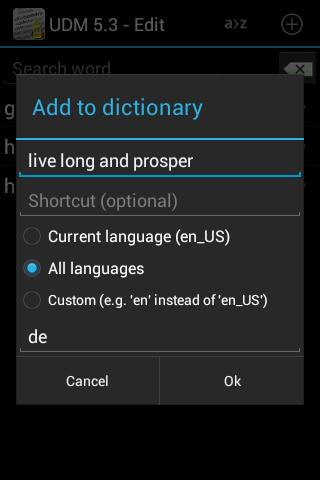 DEX for Android is an offline and online Romanian explanatory dictionary - Dictionar Explicativ Roman - running on the Android platform. Intrebarile acopera o mare parte a istoriei (200 de nivele) si se vor inmulti in versiunile urmatoare. Subiectele incep din perioada dacica si ajung pana la perioada contemporana. Aplicatia(doar versiunea pentru Android) este multi-utilizator, deci utilizatorii se vor putea intrece, iar in versiunea urmatoare vor putea incarca cele mai bune rezultate pe internet. Interfata Istoriei Romanilor este simpla si atractiva, asemenea si efectele sonore care insotesc utilizatorul de-a lungul testului. Istoria Romanilor se adreseaza unui public incepand de la 12 ani prin simplitatea, caracterul distractiv si nivelul educativ pe care il produce. Please read the Important! section below before downloading this application. This application does not work on some HTCs and custom ROMs! It seems some HTCs and custom ROMs do not implement the standard Android framework. If you are experiencing problems and you are using an HTC then please just uninstall the application. Unfortunately, this is not a developer error, it's a firmware issue. It totally depends on the HTC ROM. If HTC will implement the standard Android in a future firmware, then this application will work. Without a new firmware from HTC this application cannot work. 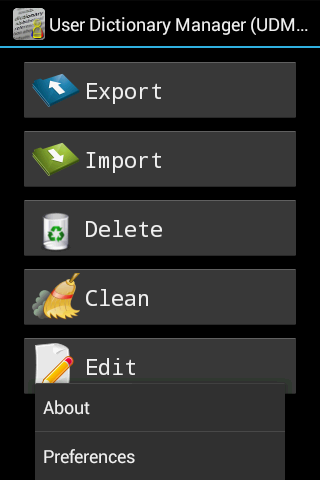 + updated "order by" statements in the Edit screen. + updated to work on Marshmallow and newest Android versions. How to import words from a TXT file? 4. 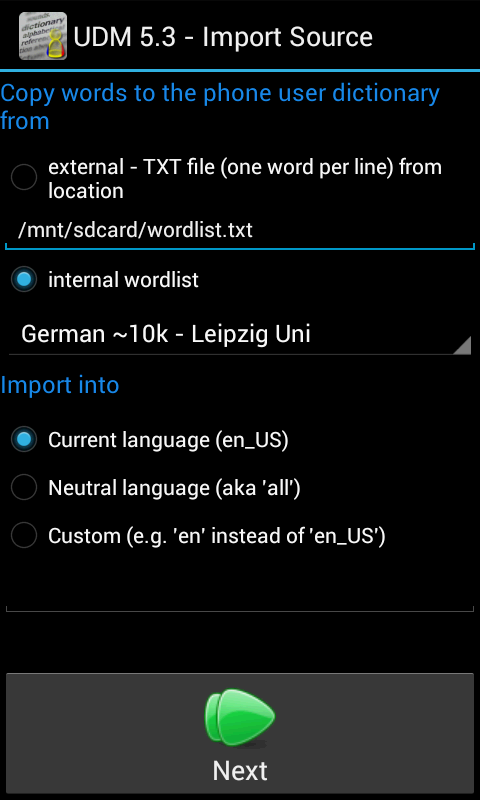 Start the User Dictionary Manager (UDM) and in the Import Source screen, choose to import from the external TXT file. As of version 3.1, the User Dictionary Manager (UDM) supports UTF-8 encoding - for Russian, Chinese, etc character sets. Cannot import Russian, Chinese, Spanish, etc word. What to do? open your wordlist.txt using Notepad++. Do NOT use the simple MS Windows Notepad!!! 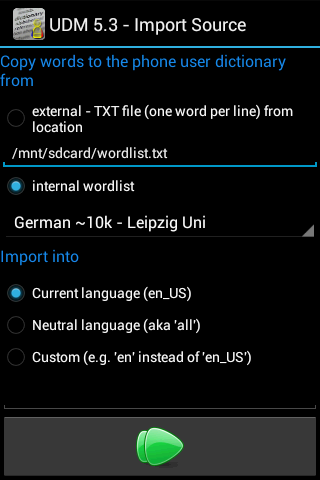 Copy the wordlist.txt file to the sdcard of the phone and you should be done. Please remember that your wordlist.txt file should contain at most 7000 words!!! Edit: see below question. How many words should the wordlist.txt contain? It has been noticed - by empiric testing - that more than 7000 words will probably kill your phone. Edit: some people have reported that importing 30000 words works fine on some newer Android phones. Where can I get word lists in my language? You can start by looking at OpenOffice dictionaries and other sources. Here is a list of 85.000 Spanish words provided by Antonio Perez. Here is a list of 93.000 Finninsh words provided by Antti Kurittu. Here is a list of 2.500 Dutch words provided by Edgar Meij. Here is a list of 76.000 Romanian words provided by Alex Popa. The below lists are imbedded in the application - you don't need to download them anymore. Here is a list of 800 English words provided by Erwin Soo. Here is a list of 2.000 Slovene words provided by Marko Gergic. Here is a list of 2.000 Romanian words provided by Adrian Vintu. Here is a list of 30.000 Portuguese words provided by Henrique Alves. 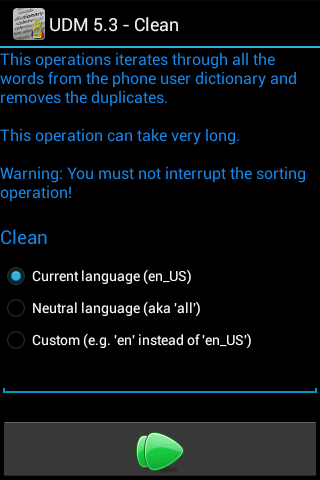 Please use this with care - on my Samsung Galaxy importing this many words takes ages, for example. Here is a list of 67.000 Catalan words provided by Roger Olivet. Please use this with care - on my Samsung Galaxy importing this many words takes ages, for example. Here is a list of 5000 Catalan words provided by Joan Montané --- Sofcatalà. Here is a list of 11.000 Dutch words provided by Jared. Here is a list of 3.000 Dutch words provided by Jared. Here is a list of 4.000 Spanish words provided by Jose Pardo. Here is a list of 26.000 Hungarian words provided by Zsolt Bodnár. Here is a list of 4.000 Farsi words provided by Arefkhani Ehsan. If you have created word lists in other languages, I would appreciate if you would send them to me so I can post it on this website so everybody can download them. Do you have any other Android applications? I would like to send suggestions, questions or requests. How do I contact you? Navigate to the Contact section. I am a programmer and I am interested in Android, J2ME, etc. Do you have a blog with interesting articles? Thanks for the application idea goes to Andrei Diaconu. Thanks for testing and improvement ideas go to Erwin Soo. Suggestions, questions and requests are always welcomed at adrianvintu@yahoo.com. Stay up to date with new releases of my applications and new blog articles by connecting to my Facebook page. My blog address is http://www.adrianvintu.net/blogengine. If you are an Android programmer, you must check this link out http://adrianvintu.net/blogengine/post/Colored-Logcat-Script-for-Windows.aspx. Use the links below to share this article to your friends.